BeHappy2Day.com is a great affiliate marketing tool that gives our partners a genuine opportunity to build substantial online revenue by generating leads and sales on the website. With over 15 years of business knowledge and innovative website features BeHappy2Day.com makes the dating experience of its users be truly engaging and memorable. Affiliate partners are able to tap into a rich stream of more than 1.5 million affluent Western men who are searching to meet and date stunning women from Ukraine, Russia, Asia and Latin America. With some of the highest commission levels, you can be assured that you’re investing your efforts into the top affiliate program that can easily pay dividends. 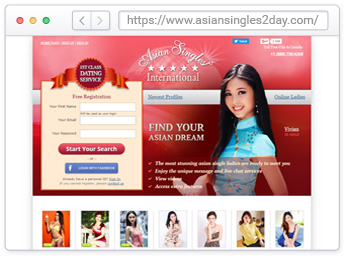 AsianSingles2Day.com is the perfect website for men from all around the world to meet beautiful Asian women. The site is especially popular among Western, Australian and New Zealand men, and this popularity lends itself perfectly to successful affiliate marketing. The Asian market is one of the fastest-growing areas of online dating, and is in high demand among affluent relation-minded men who wish to date graceful ladies from across Asia. This allows affiliates to earn stable income from sending targeted male traffic to the website, with leads and sales rewarded with excellent rates of commissions. Affiliates can always rely on the dedicated Affiliate Managers who are on-hand to guide and advise. OneWife.com is a hugely popular international dating and marriage project. It attracts tens of thousands of users, each taking advantage of the array of tools and functionality available to them on the website to help meet their future spouses from former CIS countries, Asia and Latin America. OneWife.com offers a great opportunity for affiliates to earn lucrative payouts by introducing referral traffic to us. We pay favorable rates of commissions for referrals converted into leads or sales. With the website’s excellent track record of success, efficient marketing tools and a dedicated Affiliate Support, promoting OneWife.com can be one of the easiest bits of affiliate marketing that you do. AllTverLadies.com is one of the leading websites for Western men who are looking to meet and date women from Slavic and Asian countries. 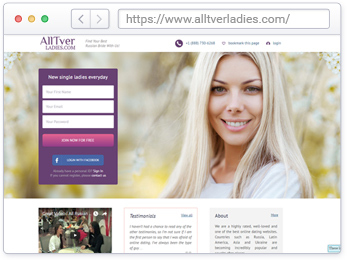 AllTverLadies.com boasts a vibrant community of beautiful and sophisticated single ladies from Russian, Ukraine and China. As a result of its strong user base and elegant offer, this website presents a fantastic opportunity for affiliate marketers! By promoting the website and referring high-quality and targeted traffic to it, you can earn extremely favorable rates of commissions when those referrals convert in to leads or sales. Take advantage of this rapidly growing community of Western men and gorgeous single ladies who are looking to meet their future partners!